This version of a frozen snickers candy bar are a bit labor intensive but you will not mind once you taste them. Line 9x13 pan with parchment paper (cut corners of paper to make it fit) NOTE: be sure to let each layer freeze completely before adding next one. Bottom (Chocolate) Layer: In a sauce pan melt; 1/2 C Unrefined Coconut Oil, 1/2 C Cocoa, 1/2 C Maple Syrup, 1 teaspoon vanilla. Pour into pan and freeze. "Ice-Cream" Layer: In a blender or food processor, blend previously sliced and frozen organic bananas (approximately 2 cups) with coconut milk and vanilla. I use a magic bullet and fill it to the top. Use only enough liquid to get it blended. Pour over chocolate layer and freeze. Make sure you have a nice even layer. 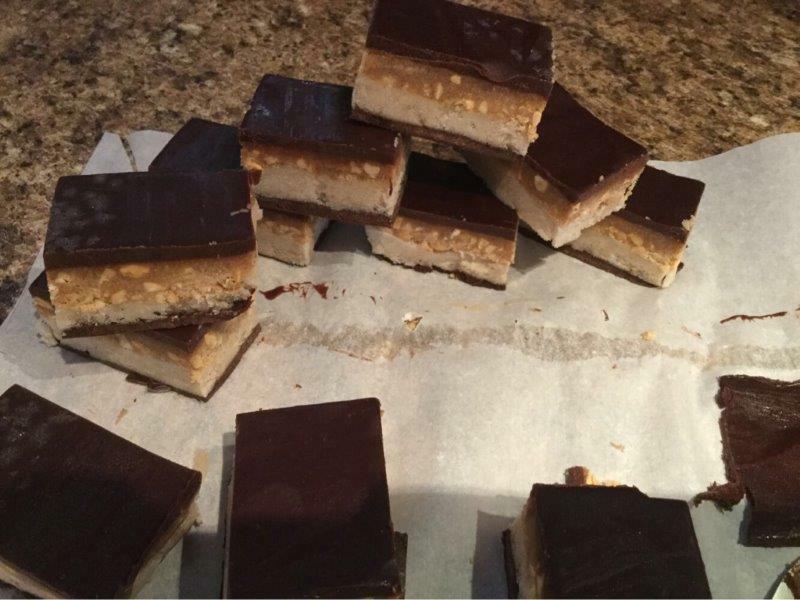 Carmel Layer: Melt 1/2 C Unrefined Coconut Oil, 1/2 C Maple Syrup, 1/4 C Almond Butter, Vanilla and 1 C coarsely crushed Peanuts and spread evenly over banana layer. NOTE: In the bars pictured I used a bit more of everything for this layer - and it's a bit overpowering so I adjusted everything down. Top (Chocolate) Layer: In a sauce pan melt; 1/2 C Unrefined Coconut Oil, 1/2 C Cocoa, 1/2 C Maple Syrup, 1 teaspoon vanilla. Pour into pan and freeze.